The Yamaha R15 is a bike that doesn’t look like it needs any extra incentive to go faster. 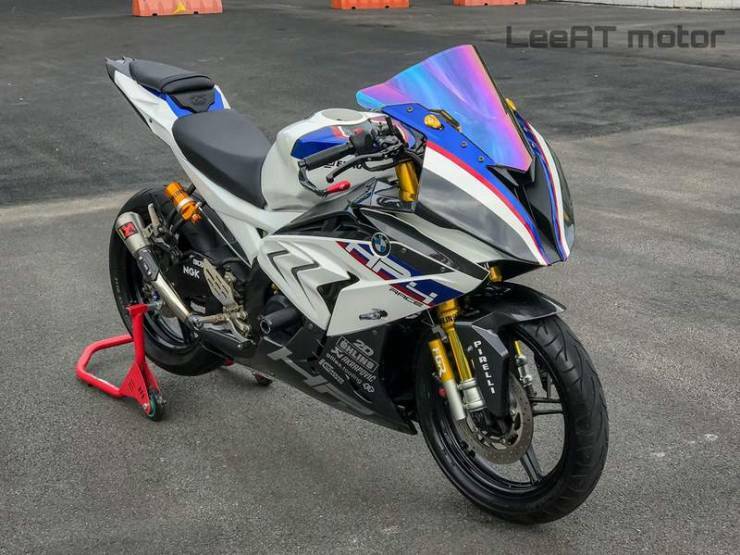 However, LeeAT Motor from Ho Chin Minh City, Vietnam, have transformed an R15 2.0 into a road-going replica of one of the fastest motorcycles on the planet, the BMW HP4 Race. The transformation of the R15, which sells at around Rs 1.2 lakhs into an Rs 85 lakh HP4 Race motorcycle from BMW is thanks to quite a few cosmetic upgrades, a new paint job, BMW badging and a few mechanical changes. However, any BMW fan will recognise this bike to not be a faux HP4 Race thanks to the presence of headlamps and the wheels among a few others, which have been retained from the donor bike. The BMW HP4, which is not made to be ridden on the streets does not feature any headlights/ taillamps or turn indicators or even a pillion seat. In terms of changes, the original Yamaha R15 V2.0 features new front fairing design, carbon fibre accents along with BMW badging and HP4 Race graphics and branding. Also seen up front are clip-on handlebars. The R15’s fuel tank has been beefed up as well and looks a lot more muscular than before. The modified R15 also gets a step up seat with the pillion section perched on top of the sharp tail section of the bike. 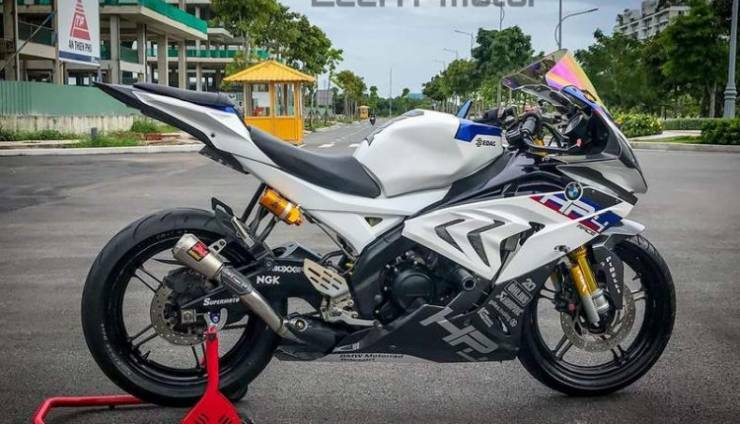 The modified R15 V2.0 also sports what appears to be a custom exhaust setup from Akrapovic. The suspension setup on the R15 2.0 features upside-down forks up front which mimic the Ohlins FGR 300 setup found on the BMW superbike along with a monoshock at the rear. Braking duties continue to be handled by the Yamaha’s single disc setup on both wheels. The engine too it would seem remains unchanged though there could be some sort of performance gain from the custom exhaust setup. The original 150cc engine from the R15 V2.0 was rated at 16.7 Bhp and 15 Nm torque and mated to a 6-speed gearbox which is a lot less than the output that of the BMW’s 999cc engine that pushes out 215 Bhp and 120 Nm of torque. 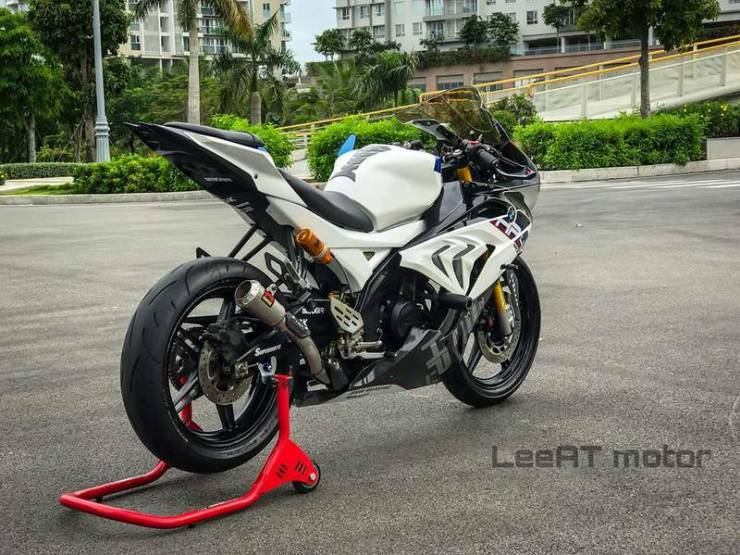 The total cost of transforming this Yamaha R15 V2.0 into a BMW HP4 Race was around VND30 million which translates to around Rs 95,000.